The Best Car In The World? Although not an owner of one of these magnificent beasts I am fortunate enough to have driven one, in comparison with its bigger and older brother the Continental Series, no less. I had always been a fan of the Continental; its raw powerful looks and sheer road presence always allured me. I was always so impressed by the way that whenever you see one on the road, it seems to be going past at great speed yet appearing totally unruffled, a task mimicked well by the 'smaller' Arnage. So, when a Cardiff dealer offered me the chance to take part in a test drive day in the grounds of a luxurious hotel, lining up the whole Bentley range next to a chartered helicopter and sumptuous servings of quality food, I couldn't resist. It would be ungentlemanly to refuse, wouldn't it? So I got my chance in a Continental. The keys, a full tank and a stunning twenty-mile route to savour. And I did. The car was very special, as you might expect for a quarter of a million pounds. Forget the opulent interior - it was the engine that impressed. Try to imagine someone pushing the back of your chair right now. Into the next room. Through the wall. Then into the next room, without hesitation, even quicker. All more speedily than you could read this. Yes, forget horsepower. From now on, I buy my cars based on torque, whatever a Newton Metre might be. There was one caveat to the Continental though - the Arnage. 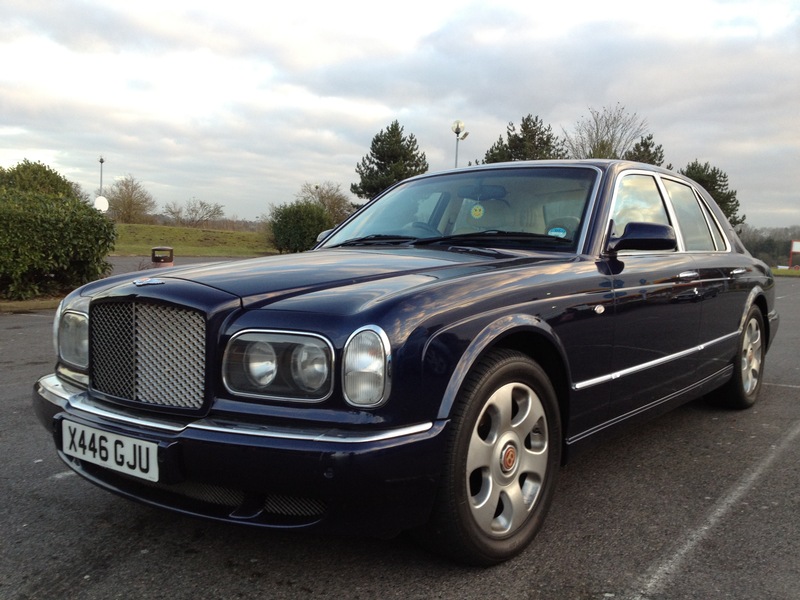 At nearly half the price the Arnage wipes the floor with the Continental. When I tested it, it came in two flavours. I'm talking engines again, by the way. The traditional V8 lump and the newer BMW-sourced straight 8. Bentley helpfully made it easier by labelling them Red and Green, quite literally. Go for the Red one. I'm a new fan of all things BMW but this car needs the V8. I just wish it wasn't named after the cheapest tea in Tesco. The Arnage shares all the grunt of the bigger car and sets it all to a modern theme. From the outside, the car does resemble a weather-worn brick but inside, you realise this can compete with the best-finished modern cars. Some comment that it can't match a Mercedes-Benz's build quality and to an extent, they would be right. When the floor carpet is pulled back around the accelerator, you do not expect to see the trimming work of a six year old. But when the carpet is reinstalled the thick pile helps to remind you that you are in a special place. The drive is modern, easy and relaxing, even when applying that torque. The interior ambience is impressive although the modern devices we all need in cars today are not as well accommodated as they might be. Designed before the satellite navigation era, you will have to suffer the indignation of a pop-up screen spoiling the sweep of the dash, but I suspect you will be more likely looking at the array of dials and switches, many designed and styled to feel good, solid and traditional. The only gripe is that because customers can select from a huge range of colours and trims (The 'brochure' was a hand-finished solid wood briefcase), getting a used one to suit you perfectly may be a problem. Burgundy leather seats trimmed with cream piping and mixed with a black dash don't quite do it for me. The drive is solid and reassuring and belies the car's two ton size. Forget you are in a limousine and treat it the way Bentley intended. It is a sports model after all. If you want to float everywhere, get one with a small silver statue at the front. The Arnage will flick through corners and holds the road like the tarmac's melted. You don't even get to hear the rubber ripping. Very strange. Very addictive. But the best bit is sitting deep in those accommodating hide armchairs and looking down at people next to you, even those in four by fours. Gripes? Well there are always some. On the pre-2005 model I drove, I don't think the headlamps suit the nose, the fuel consumption is for those who never care about it, and it costs £150k. At least it's better than that Continental I always wanted. Thanks Bentley, you have saved me £100k. Now save me another £30k by making the new baby Bentley even better. The first image shows part of the Bentley line up presented by a generous Cardiff Bentley Dealership in the grounds of Miskin Manor in 2000 and was added in Version m5.075 23 Feb 2018. 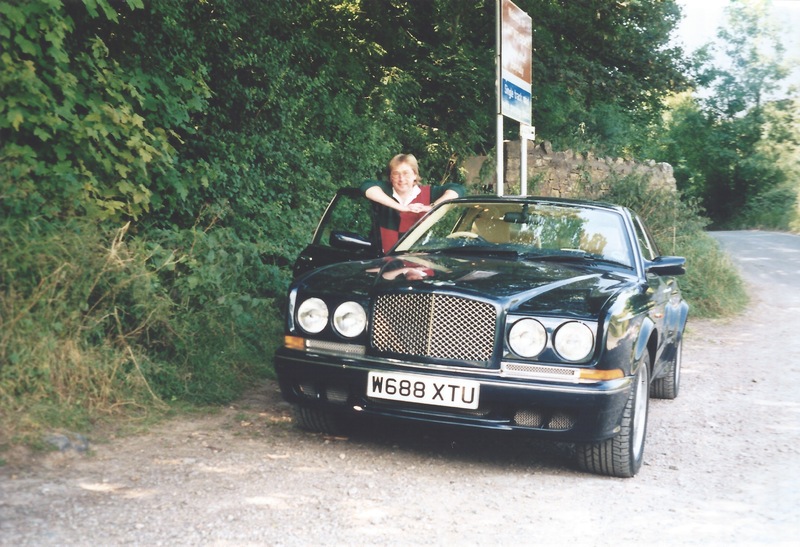 The second image shows the author parked up during a road test of the fabulously expensive Bentley Continental in 2000 and was added in Version m5.075 23 Feb 2018. 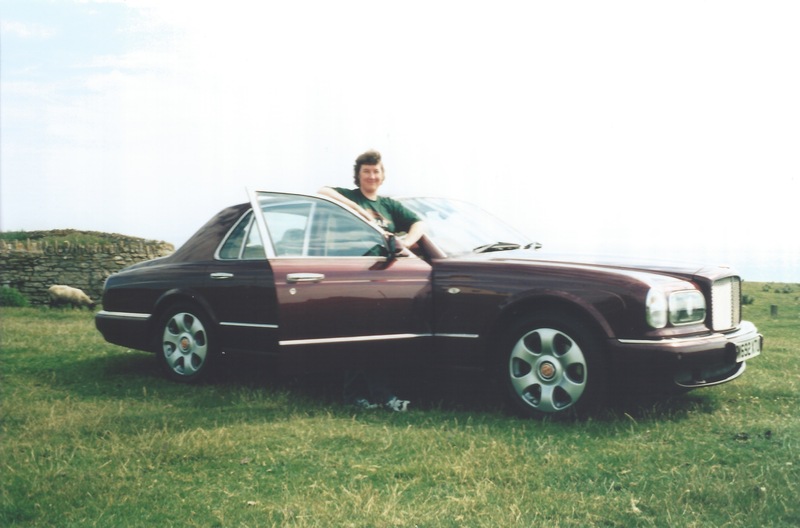 The third image shows the Author's wife, Lynda, with the Bentley Arnage in 2000 and was added in Version m5.075 23 Feb 2018. The fourth and final image shows a Bentley Arnage, parked in a service station car park, photographed in Jan 2012 and was added in Version m5.075 23 Feb 2018.